Off-road the answer is easy - once you leave pavement shift from 2WD (S - Strasse = street) into 4WD high (SA - Strasse Allrad = street 4WD) and leave it there until returning to pavement. It is a proactive measure to maintain traction in all conditions. Use 4WD low (GA - Gelände Allrad = off-road 4WD) before you need to negotiate any really difficult off-road obstacles. 4WD low about doubles the torque (good for steep climbs, pushing a tree off the road etc). 4WD low also comes with extremely slow speeds. That is good. It allows you to go more than half as slow as it would be possible in 4WD high. Going slower gives you more control, gives you more time for precise steering and more time to think about your next step of action in a difficult environment. NEVER use any of the 4WD settings of the 460 and 461 series on dry pavement. Part time 4WD will cause unsafe handling characteristics (understeer) and weird braking behavior. Youll swap ends in no time. Besides the stress caused by front and rear axles wanting to go at different speeds it can cause an internal mechanical bind that either stops your vehicle in its tracks or will brake/bend something expensive. See: part time limitations. Important: 460 series and early 461 series have the VG080 transfer case with part time 4WD! Using part time 4WD on slippery pavement properly is a tricky one. No wonder most SUV now feature full time 4WD - it has none of the part time draw backs. Part time on rainslick roads? NO! No advantages - only disadvantages. Part time on snow and ice? Hmmm.... Well, yes - but also, no. First of all, vehicle will understeer (turns get wider than planned). Stopping might become dangerous. Here is why: Since both driveshafts are locked together the axles receive equal torque for pulling - now thats good - but either through engine compression or stepping on the brake both axles will also receive equal stopping power - and that can be really bad. Remember that brakes are layed out in a way that 80% of the stopping force goes to the front and 20% to the rear? That keeps the rear from getting too much stopping power, losing traction and swapping ends. The front axles would always lock up first - keeping the rear wheels rolling and providing stability (lateral force). In SA or GA the rear axle gets as much brake power as the front. Part of the 80% to the front will be transferred through the drivehafts to the rear. That way both axles get 50% of stopping power. In this constellation when stopping hard both axles will break lose and slide. The rear will come around since no more lateral force will keep the vehicle stable. Roll overs are just waiting to happen. "happened to my wife yesterday, I was following her out of the ski area, down the hill, pure ice. She was in part time 4wd in our 460 chassis. the mistake she made was shifting into 3rd pre-maturely and cruising into a downhill turn at low revs. When she realized that she needed to slow down, she downshifted to second, and it immediately did a 180 on the ice. no brakes were applied at all." It will only be engaged when additional traction for pulling is needed. Up the snowy pass, up the steep slippery driveway. Also when getting the vehicle to move on anything slippery (snow and ice at a traffic light etc.). Once the vehicle is moving I always shift back to 2WD (why do you think the Mercedes engineers produced such an expensive transfer case that can be shifted back and forth at any speed?) Especially on anything downhill I make sure I am not in 4WD - remember Mikes wife and her 180! Now that brings us to how to shift from 2WD to 4WD - it can be done at any speed. Just move the lever. It moves as easily as a knife through butter. It is not even necessary to shift into neutral for this procedure. The VG 080 transfer case is fully synchronized. 4WD Hi to 4WD Lo (SA to GA) is a different story, theoretically there is no speed limit for switching. All you need to do is step on the clutch (but leave the selected gear in) shift transfer case from SA to GA. The transfer case will happily accept the order at any speed - but if you are too fast your engine will over-rev once you let your clutch up. So, since your transfer case has a 2.14:1 ratio (multiplying torque by that factor and reducing the wheel rpm by that same ratio) you should always be at less than 1/2 of the maximum speed for any given gear when shifting into GA. But since GA is designed for low speeds anyway - so who would want to shift from SA to GA at 50 mph? 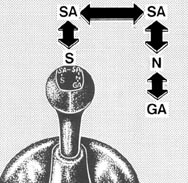 Example: If the max speed of 1st gear is 15 mph you can shift from SA to GA safely at about 10 mph. Lets assume the engine revs 4,900 rpm @ 15 mph in SA - after letting off the gas and reving 2,300 rpm @ 5 mph you would shift from SA to GA - after letting up the clucth the engine would go about 4,900 rpm @ 5 mph in GA (2,300x2.14). But here is your way out (experts only): Lets say you are in SA going 20 mph in 2nd gear and have a need to go into GA, step on clutch shift from SA to GA, shift your transmission from 2nd to 3rd, let out clutch slowly and your engine will just purr along. Same thing when shifting from GA to SA: Lets say you needed the low setting to get going and gain some speed, lets say you are in 4th gear GA going 45mph, step on clutch select SA, shift transmission to 2nd or 3rd, let out clutch. Praise Mercedes.The G's transfer case is fully synchronized. First couple of times I would always let out the clutch extra careful to see (hear) whether the rpm of your engine are safe.Supposedly shifting from SA to GA and back also works with automatics shifted into neutral while moving - however, it never worked on my 280GE. In real life it is much more likely that you will select GA at standstill - those difficult spots in the off-road world make you stop and scratch your head anyway. Now, when to lock the diff(s) - to lock or not to lock? *Warning: motor sports and activities are potentially dangerous. The information listed in this web site does not hold its author or representatives liable for any damage or injuries sustained. Copyright © -2002-2008 Harald Pietschmann.